We didn’t plan it this way, but I’m thankful the gospel assigned for the Annual Meeting this morning is the Good Shepherd. It could have been Noah and the Flood. It could have been Jonah and the Whale. It could have been Daniel in the Lion’s Den. I’ve got friends whose annual meeting text is Herodias asking for John the Baptist’s head. There’s a lot to be thankful for. And I’ve been doing some research about shepherds. As it turns out, a good shepherd does know each member of his flock by name, though he is more likely to call them by distinctive monikers like “Brown Spot” or “Short Ears,” I am told, than he is to call them something like Charlie, or Stewart, or Jane. In Biblical times sheep were raised for wool more than they were slaughtered for food, so knowing them by name was pragmatic. Apparently sheep will stand still to be shorn if you call them something more particular than “Hey, Ewe.” One also protects his investment if he knows his sheep well enough to spot an illness or a limp right away. Sheep are better off if they grow accustomed to his familiar tending, and so is the shepherd. This shepherd with the inviting voice, who helps his sheep do what they were born to do, reminds me of the unlikely hero of the movie Babe. As you may recall, Babe is a most surprising sheepdog because he is a pig, and he tames a rather fussy flock of sheep. They had been terrorized by a dog who had grown angry and violent, and for their own safety and the good of the farm, Babe wins their trust through his quiet, patient care. He directs them through kindness instead of threats. It’s obviously a fantasy—this exceedingly good shepherd is a bit too nice—“Pardon,” he says to one obstreperous fellow. “If it is all the same to you, could you please not get into trouble anymore? Thanks.” Sometimes a nip on the bottom is a better way to get a sheep (or one of us) moving in the right direction. But the point is well taken: good shepherds know their sheep and what they need, and the wise ones cajole more than they command. I believe Jesus does, too. Years ago I asked a group of boys at St. Albans to describe God. What does God look like? What does God do? Not much happened, so we got out paper and I asked them to make a list of God’s attributes, sketch a description, or draw a picture. Here’s what they told me: God has long hair and a beard, wears sandals, and throws lightning bolts. They were messing with me, so I asked them what power this image of God had for them, and they looked at me with puzzled faces and silence. So I took a different tack. Write down the questions you have about life, I asked them, questions that bother you and don’t seem to have any easy answers, things you would ask God if you could sit him down in front of you. Slowly the juices began to flow. Why do bad things happen to people who haven’t done anything wrong, they asked me. Why is there evil in the world? What happens after you die? Does God have a religion? Why does God take away people that you love? We scribbled it all down on the blackboard, and I told them what lay underneath my question: Your image of God has to do something for you. It has to have power if it is going to make any difference. The changes and chances of life provoke our toughest wondering…Why did my sister die? Why does my brother suffer from mental illness? Do I have a purpose here? Is this all there is? If your image of God means a thing, it has to have currency where its value is most needed. I asked the teenagers to try on a few images of God for size. What about the Way, the Truth, the Door…Healer, Sustainer, Redeemer …Justice, Mercy, Peace… Father, Mother, Shepherd, King? You know how a good shepherd works? He watches, and listens, and offers some guidance. She coaches and corrects and calls out our best selves. He holds and heals and puts his life on the line. She feeds and nurtures and inspires. The good shepherd invites mission in to the deepest part of ourselves and empowers mission out to serve. This has been a year of mission out/mission in at Redeemer. In music and worship, we added monthly Compline, led by a 14-member Schola, invited Community Engagement Partners as readers in our Lessons and Carols service, worshipped twice with the Helping Up Mission Choir, and welcomed Choir Schools from New Jersey and Connecticut. We heard early music and folk songs in the parish hall. We named Henry Lowe Music Director Emeritus, and travelled last summer to England with 45 children and adults. The Choir School of Baltimore was launched, offering rigorous choral education and performance opportunities to young people who might not otherwise have it. 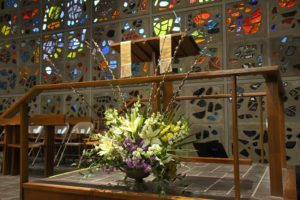 The Friends of Music devoted a portion of concert offerings beyond our walls, strengthening Paul’s Place, Safe Streets, and Hurricane Relief in Puerto Rico, and twice presented parishioners’ art on these walls. Next Sunday we host our first Royal School of Church Musicians Choir Festival, and will offer monthly Evensong next October-May. Thank you Bert, and Robert, musicians, and choirs. We are broadening the concept of Health and Wellness in the Redeemer Community. Caroline initiated the St. Luke Prayer Ministry, training lay leaders to offer prayers at all three services on the first Sunday of the month—with the goal of expanding the ministry to every Sunday starting in the Fall. The lay-led grief group, Sacred Space for Grace was offered three times, in six-week sessions. Caroline took a course in Mental Health First Aid, and has since trained 51 individuals in the parish and beyond, with additional workshops on the calendar, and created an e-mail group which now numbers 100 people dedicated to mental wellness. 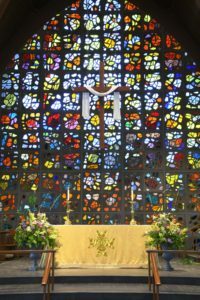 In May we will recognize Mental Health every Sunday through adult ed or in the liturgy. In June Redeemer will co-sponsor a screening of the documentary “Living While Dying” followed by a discussion led by the filmmaker. Contemplative prayer takes place two times each week, with workshops throughout the year. Men’s Fellowship, WWW, Tuesday group, knitting, the prayer group, vergers, lectors, LEMS, ushers, and the Rector’s Bible study round out our mission in. Thank you to all the group conveners, to Caroline, and Barb who do so much to make our pastoral fabric strong. Cristina is completing her second year as Associate for Community Engagement, and the fruit of her leadership is palpable. Redeemer became an official member of BUILD in January, and since then over two dozen parishioners have participated in one or more of the following: issue/action training focused on economic development, youth trauma, equity in mental health, policing and community safety. Cristina sponsored “Lent to Go” introducing parishioners to community partners through site-visits, and she is the glue that connects the weekly volunteers at Govans School, Habitat for Humanity builders on McCabe Avenue, and Paul’s Place hosts, who among other things have made 39 casseroles since last June, not to mention GEDCO Cares food pantry, Good Schools Baltimore, Turnaround Tuesdays, THREAD, the Ark, Asylee Women, 3 buses to the March for our Lives in DC, and 1900 pairs of Boots for Baltimore. Caring for Creation won a grant to study how to make our north parking lot environmentally friendly, hosted a native plant sale, and invites us today on Earth Day to plant a garden on our campus. Thank you Cristina and each of you for saying yes to the invitation to serve. This year the Parish Day School, led by Mary Knott, enrolled 121 students ages 2 through pre-first, and employed 19 faculty and staff members with an average of 13 years teaching experience. They completed a comprehensive curriculum self-evaluation, creating a guiding document for student growth. Always thrifty, recent updates to the facility include replacing the original classroom cabinetry from 1957. PDS continues to promote an environment that stresses kindness, the value of learning through mistakes, and the important role our children have as unique individuals within a community. Thank you to Mary, PDS faculty, parents, and students. Children and Youth programs in the parish are growing. Children’s ministries director Kathy LaPlant queried parents last year about our program and schedule, and changes have increased participation. Lesson plans are now coordinated with what parents are hearing in Church, start time is later, and attendance is up 36%. Youth ministries director Paul Smith has added the Redeemer Service Corps, involving our youth and others with opportunities to serve the community. RYG attendance is up in the last two years, with emerging leadership among 7th-9th graders. Maggie Klaes led the cast of Annie, with Govans, PDS, and Sunday School kids filling the floor in 3 performances. And I am happy to announce that Matt Buck, son of the parish, vestry member, and Calvert middle school head will begin as our Acolyte Master this Fall, bringing fresh vision and energy to this important youth ministry. Let’s give thanks for our children and young people and all those who serve them. The Redeemer VOICES speaker series was newly branded this year, thanks to a strong steering committee, and we’ve added a program this May and June. Highlights include partnerships with the Pratt Library, the BMA, and a consortium of environmental groups. Join us in the coming weeks for, among others, Brit Kirwan, portrait artist Amy Sherald, humorist Christopher Buckley, and columnist David Brooks. I am happy to announce that Molly Hathaway and Caroline Stewart will be coordinating Redeemer’s Ministry of Planned Giving, which we are calling “The Next Generation,” and about which you will receive a letter in the next few weeks. Another announcement is that Ellen Chatard, Director of Program, will be going on sabbatical May 2 through August 6. Ellen will do some travelling and spend restorative time with family, and I’ve instructed her to change her phone number, so that I can’t contact her while she’s away. Thank you to Ellen and all of the program support staff: Darlene, Barb, Mark, Chuan, and Vu. Easter, Palm Sunday, and Christmas were the biggest in memory, and average Sunday attendance was 418. We have 1000 Facebook members and each week 500 distinct users open our e-redeemer reflection. Outreach giving has doubled, and the creation of the Covenant Fund promises that our ability to serve the poor will deepen and broaden in the coming years. The mission of the Church of the Redeemer is clear: we are bringing hope and healing to Baltimore, serving out, nourishing in, like the Good Shepherd we follow. So what is your image of God, and what difference does it make for you and the people you encounter? If God is love, then there is no place for hatred. If God is justice, then the poor must be empowered and fed. If God is healing, then there is wholeness possible no matter how broken we may be. If God is life, then death is only a horizon beyond which our eyes cannot yet see. If God is the beloved community, then we are called to build it with neighbors and with partners and with strangers we don’t yet know, across the aisle and across our breakfast tables, throughout the city and right here, right now. Thank you for another great year. In early March when a wicked nor’easter blew through town, “Do you have power?” was a common refrain. Thinking about power is something I find myself doing a lot these days. Perhaps it’s because of the seemingly never-ending examples of abuses of power, rampant in the news. Perhaps because, as a parent and as clergy, knowing how to responsibly and appropriately use the power I have is paramount. Perhaps it’s simply because power, as a theological concept, is interesting, relevant and important to noodle over and wrestle with. It feels important to note that in performing healing miracles, Jesus acts in response to requests put forth to him by others, or only after having asked someone, “What is it, that you would like me to do for you?” and listening to the response. In other words, Jesus uses his God-given power to heal in respect of and in accordance with the free will and free choice of a human being; Jesus’ power is relational. Today’s most popular, contemporary myths and stories centering around power, and the right use vs. the abuse of power, mirror a similar theology of power presented in scripture: power used in the service of and for the benefit of others, to heal, uplift and empower them, in harmony with their own desires, free will, free choices and self-identified needs, is “good”; whereas power used to control, manipulate, harm, take advantage of, abuse or oppress others, against their own free will and self-determination, is “evil”. Darth Vader and the Emperor in Star Wars mythology, and Voldemort in Harry Potter lore, are evil precisely because they view and use power as a tool to dominate and control others for their own self-aggrandizement, against individuals’ free will. Lately, I have enjoyed learning and thinking about power through a new lens: the lens of community organizing. Thanks to a week-long training last fall co-sponsored by Metro IAF, NEXT Church and Johnson C. Smith Theological Seminary and the work I’ve been engaged with through BUILD, the Metro IAF affiliate in Baltimore, I have come to understand an additional perspective of power: that power “in the world as it is” (as opposed to the world “as it should be”) = “organized people” and “organized money”; and that the accumulation of power around people’s shared values and common self-interests — “self-interest” having to do with the true “essence” of each human being — and where these interests align, can lead to effective action, moving the “world as it is” bit by bit towards the realization of “the world as it should be.” In my view, this new understanding of power complements and helps to “ground” and “bring down to earth” the theology of power that I understand through the lens of Christian scripture. It provides a practical “how to” approach, to help realize more pockets and places of “heaven on earth” for all of God’s people. Doubters can get a bad name in many church communities, but you are in good company here. The sign of deep faith, in fact, is in the questions, not the answers, in resilience, not rigidity… in the courage to face the worst that life can deal us and to hang in there. But tradition has not been kind to Thomas—he is labeled “doubting” because of the questions he raises in the gospel last Sunday. Yet the only difference between him and the other disciples, as far as I can tell, is that he voices the fears that I’m sure they all had. Interestingly enough, the name Thomas means “twin,” but try as we might, we’ll find no record of his sibling anywhere in the scripture. So he is us, I believe, and his questions are those that many of us voice at one time or another: “Hello, my name is David, and I’m a doubter.” There is room in this house for everyone. We hear what people believe and don’t believe mostly when things are tough—at someone’s bedside, when he is in a lot of pain, when the diagnosis is grim. The doctors might leave the room for a minute, and your friend grabs you by the hand and says, “I’m scared, and I’m not sure what I believe anymore.” I’ve learned to just sit there, mostly silent, and hold on. Seemingly accepted customs of racism and misogyny challenge our belief in humanity, as do systems of education and access that privilege a few over the many. Settling for the bizarre statement that “the poor will always be with us” is enough to shake our faith in religion, as does any accommodation we make for violence. But Jesus’ radical inclusion breaks through all of that—Love is more powerful than any darkness we can conjure. Even our despair won’t chase love away. A friend told me years ago, “The gospel isn’t about whether we believe in God or not. The good news is that God believes in us.” “You may doubt me, but I don’t doubt you,” Jesus’ actions say to Thomas. And in that, God has given us what we need to transform the world. It turns out that God comes to the places where we feel most empty and bereft. Doubt isn’t something to deny or hide from: doubt is the fertile soil of belief. Alfred Lord Tennyson writes, “There is more faith in honest doubt than in half the creeds.” Amen. We meet the living God not where we are most strong and on top of our game, but in the courage to confess our struggles and how far we still have to travel to get where we are called to be. According to the story of Thomas, our twin, we meet Jesus in the wounds. Theologian Walter Wink says, “The resurrection is not a fact to be believed, but an experience to be shared. It is not a datum of history, but divine transformative power overcoming the power of death. Resurrection is not a contract for a time-share apartment in heaven. It is the spirit of Jesus present in people” now, as they continue his struggle against injustice and mean-spiritedness in all its forms. Whether we doubt or not doesn’t seem to matter at all. What matters is the depth of our commitment to each other, our willingness to serve, our capacity to love. This week Redeemer finds herself in the afterglow of the celebration of Easter Sunday! There was an overwhelming abundance of joy! 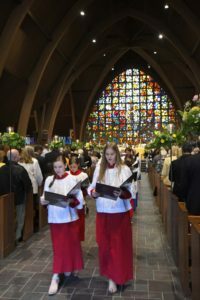 The liturgy and music that framed the worship services intersected to provide such an uplifting experience for the congregation. 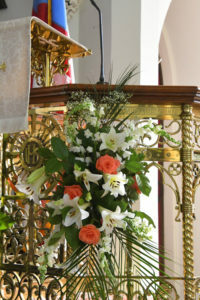 As a member of the clergy, I think every Sunday I have ‘the best seat in the house, sitting on the altar. From that vantage point I can see and hear the breadth of what is occurring in the sanctuary. 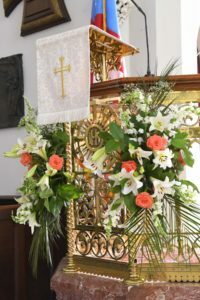 This past Sunday was particularly moving as I could appreciate in detail the flowers that the Flower Guild had so beautifully arranged at the pulpit, lectern and on the altar. They were breathtaking! The Chapel was equally stunning. 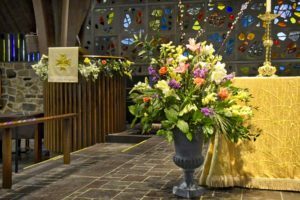 So I offer deep appreciation to Steve Sutor, Head of the Flower Guild and to the individuals whose gifts were utilized to create such floral offerings. And thank you to David Crandall whose photographs below will allow us to truly enjoy in our leisure the arrangements.